The precisely designed FISCHERSCOPE X-RAY XAN 500 is basically a movable x ray radiation determining medium that adopts energy dispersive analytical technique. Used worldwide, this machine is perfect for conducting thickness of coating and analyzing various properties of specific material without causing any damage to the object. This X ray machine acts as a reliable quality controlling solution during checking of received items and for monitoring of workflow. Being small in size, this machine can be used for measurement purpose in any terrain.. It can be utilized for measurement work on sizable surface areas like large enclosures and machine parts. This machine is perfect for mobile measurement work required in various electroplating units. It is used for mobile measurement technique for valuable metals. This x ray machine is used for solution analysis work for assessing amount of metal present in electroplating baths. All the equipments offered under the series of FISCHERSCOPE X-RAY machine are acknowledged for their long working life, stable operation and error free functioning. Moreover, these machines help to minimize the necessity of recalibration for saving labor cost and time. 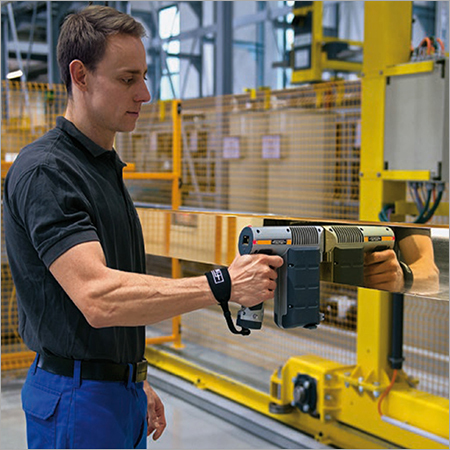 This ergonomically designed x ray detector is reckoned for its error free detecting technique and reliable operation. The advanced technology incorporated into this machine enables it to scrutinize liquid as well as solid samples and coating materials sans using any calibration method. The offered portable X-ray fluorescence level determination machine comes in handy for assessing various properties of metals like alloy and for conducting error free measurement of coating thickness. Its tilted protection system can be handled easily with one hand by its operator while measuring. This machine is equipped with tablet that supports WinFTM software and measurement box. This machine is capable of measuring coating thickness of ZnNi alloy, gold, silver and zinc sans any error. This single machine can be used for inline, stationary and mobile applications purpose. Useful for measurement of components with heavy duty design with its repeatable method. The XAN 500 acts as a complete table top system when installed in the measurement box. This machine is compatible with controlling system used in production area and it acts as a reliable detector.